Digital schemes. 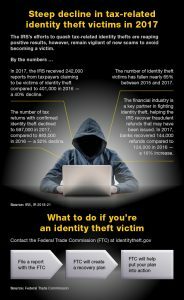 Emails that appear to be from the IRS are part of phishing schemes intended to trick the recipients into revealing sensitive information that can be used to steal their identities. The emails may seek information related to refunds, filing status, transcript orders or PIN information. The scammers have developed twists on this approach, too. The emails might seem to come from an individual’s tax preparer and request information needed for an IRS filing. Or the information request could arrive via text messages. Whether by text or email, the communication states that “you are to update your IRS e-file immediately” and includes a link to a fake website that mirrors the official IRS site. Emails also could include links that cause the recipients to download malware that infects their computers and tracks their keystrokes or allows access to files stored on their computers. • Request any sensitive information online.